Taoiseach Enda Kenny took just seven minutes to sign off from his six years and three month stint as leader of the Irish Government. The Mayo TD addressed the chamber for the final time as Taoiseach today. "This has never been about me, it's been about the challenges and opportunities this country has faced. "I have not got everything right but my motivation was always what I believed was best. "I wish you all good health to continue the work dealing with the challenges ahead." After a short, wistful speech Mr Kenny was greeted with the warmest applause by TDs from all parties and political groups. As he sat down he was visibly moved and could be seen to wipe away tears. Fianna Fáil leader, Micheál Martin, called Mr Kenny an “Irish patriot” in the course of a warm and good-humoured personal tribute. Mr Martin said the Taoiseach was courageous to take over the Fine Gael party leadership, face down the leadership heave against him, and then win the 2011 general election. Supporters carry a young Enda outside Leinster House on his first day in the Dáil, in 1975. A 1975 election poster for Enda Kenny. “It was incredibly courageous of you to work in Dublin when Michael Ring was in Mayo stealing your votes,” the Fianna Fáil leader said to laughter from all sides of the Dáil chamber. Micheál Martin said that Enda Kenny has given a masterclass to colleagues in how to conduct himself in the last few months. 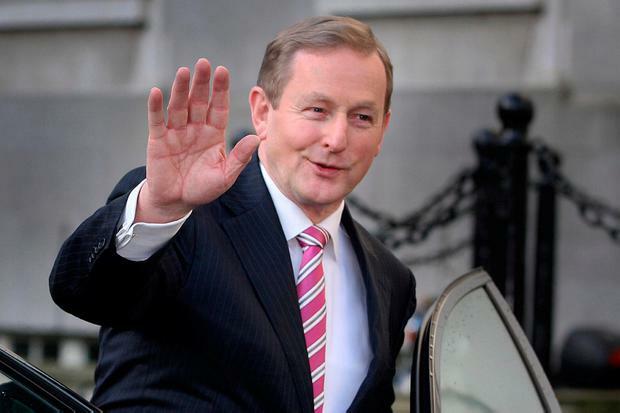 He said the Taoiseach managed his exit from the top job went “at his assigned pace”. He said Kenny’s place in history is assured. On behalf of Fianna Fáil, he wished the all the best to Kenny and his family. Sinn Fein leader, Gerry Adams, praised the outgoing Taoiseach as “the greatest leader Fine Gael ever had.” He said that while he often disagreed with Mr Kenny it was also clear that he always did his best. "I will miss your entertaining tales of meetings your have had - and indeed meetings you have not had." Mr Adams said mocking the Taoiseach sometimes calamitous love of a far-fetched anecdote. The Sinn Fein leader also cited Mr Kenny’s governments’ shortcomings in health, education and social policy. But he wished the Taoiseach, his wife and children, all the best for the future. Labour leader Brendan Howlin recalled serving in Cabinet twice with Mr Kenny, in the mid-1990s Rainbow Coalition, and more recently in the Fine Gael-Labour Coalition led by Enda Kenny. Mr Howlin said he would leave it to others to attack his legacy. “But I won’t present a hagiography of you,” the Labour leader said. With his successor Leo Varadkar is not due to be elected as Taoiseach until tomorrow, the focus will be on Mr Kenny throughout the day which insiders say is to afford the day "dignity".